Lexington, KY – In Kentucky for derby weekend — it turns out that everyone there is incredibly nice and Mint Juleps rule. Philadelphia, PA – A great place to enjoy buffalo wings as well as other “lowbrow” delicacies. Brooklyn, NY – Got to do a cool radio interview in a studio overlooking the East Village! Detroit, MI – Cheap houses!!! Saw a deer — in downtown. Grand Rapids, MI – We played with a relatively successful band in Philly that was on tour as well. They were great, and their drummer and I got along really well. We had a funny conversation about “The Sopranos” after noticing a pastel portrait of Chris Moltisanti hanging in the green room of the venue. A week later, we were playing in Grand Rapids, when I get flagged down by someone in the parking lot. It was the drummer from the band in Philly. It turns out he was from Kalamazoo, and he and his friends drove an hour to come see us in Grand Rapids. If that wasn’t cool enough already, he and his band paid the venue owner for the funny Sopranos painting and drove it all of the way from Philly to give it to me in Grand Rapids. Milwaukee, WI – Ate cheese while looking over the lake. Very yummy/pretty. Fargo, ND – Was cold. Portland, OR – Homecoming show for me, it was really great seeing all of my friends and family. It was one of our best shows on tour. Coincidentally, a transformer blew up during our “encore” song, plunging the club and surrounding neighborhood into darkness, which prompted an epic drum solo in the dark. It was really fun and such a strange coincidence, everyone thought we orchestrated it. San Francisco, CA – COFFEE HERE WILL MAKE YOU RUN THROUGH A BRICK WALL; ALSO, GOOGLE GLASS!!! Los Angeles, CA – I get why they call it City of Angels, The Big Orange, La-LA Land, Shaky Town, and Tinseltown (specifically applies to Hollywood). 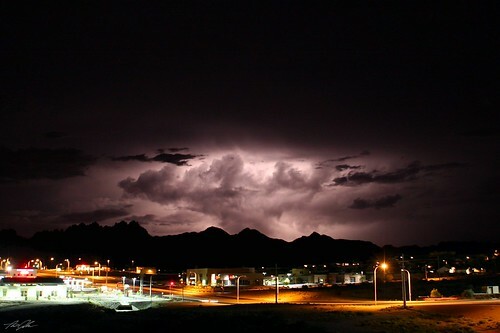 Los Cruces, NM – Got to experience a breathtaking lightning storm sort of like this one. Marfa, TX– Was originally developed to accommodate a speculative oil boom, then bought by Swedes once the oil ran out faster than expected. Additionally, all of the weirdos who emanated the weirdness in Austin moved here once Austin’s tech boom priced them out. As result, this is a super weird little art town where every single business doubles as an art gallery. Also home of this. Austin, TX– Next level food scene. Houston, TX– Definitely a pretty big place! Rothko Chapel was cool? So there you have it! Also – let it be known that the Ford Aerostar is a fine piece of machinery. I highly recommend it to anyone who is in the market for an affordable and trustworthy van.